How to Play DVDs through Apple TV 4 on HD TV 4? 4th Apple TV supports the following video and audio file formats and codecs. Before playing a DVD on Apple TV 4, you’d better make sure that its format is included in the following Apple TV compatible file formats list. If not, a DVD ripper that can convert DVDs to Apple TV 4 playable formats is a necessity. As you can see, Apple TV 4 supported video file formats are very limited, DVD disc or even the decrypted DVD rips can’t be supported by Apple TV 4. Of course, most of you are not about to pay iTunes’ ridiculous prices to watch movies and TV shows you already own on DVD. In this case, how do you watch a DVD on HD TV via Apple TV 4? Step 4. And then you can watch DVD on Apple TV 4. Note: DVD video to Apple TV 4 AirPlay requires iTunes 10.1 and superior, OS X Mountain Lion and later. And you still need the DVD disc itself when playback. It is annoying but also can be taken as an inflection point to find yourself an applicable DVD software, just rip those DVD discs to an Apple TV 4 friendly format. At this point, we recommend Brorsoft DVD Ripper for Mac, for its abundant 170+ preloaded profiles, include Apple TV 4/3/2, iPhone 6S/6/5S, iPad, Android, Windows Phone, etc and powerful DVD copy protection removing ability. Therefore, you can backup all the DVDs in your Mac and sync to Apple TV 4 for playback on your HD TV via iTunes any Time. You can also save the ripped DVDs in your hard drive and play on HD TV with a USB cable directly. For ripping DVD to iTunes for ATV 4 on Windows, please turn to Brorsoft DVD Ripper. Step 1. Download Brorsoft DVD Ripper to rip DVD to Apple TV on Windows PC, or Brorsoft DVD Ripper for Mac to mirror copied DVD movies from Mac to Apple TV 4. Step 2. Insert DVD into the drive and click “DVD disc” to load the media content. An external DVD drive might be needed for some Macbook. Step 3. In the dropdown list of Format menu, you can find several Apple TV options for output. *Ripping DVD to Apple TV 4 compatible formats works too: MP4 (recommended), MOV and M4V, which can be found in “common video” and “HD video”. *If you want to add the DVD movie to iTunes for play on iPhone, iPad, iPod, you can also directly select iPhone, iPad, or iPod as the output format to get videos with optimized settings for your iDevices. Step 4. Click “Convert” button to rip DVD to Apple TV 4 supported format. . Afterwards, transfer the DVD to iTunes and import to Apple TV 4 for watching with ease. There you have it! 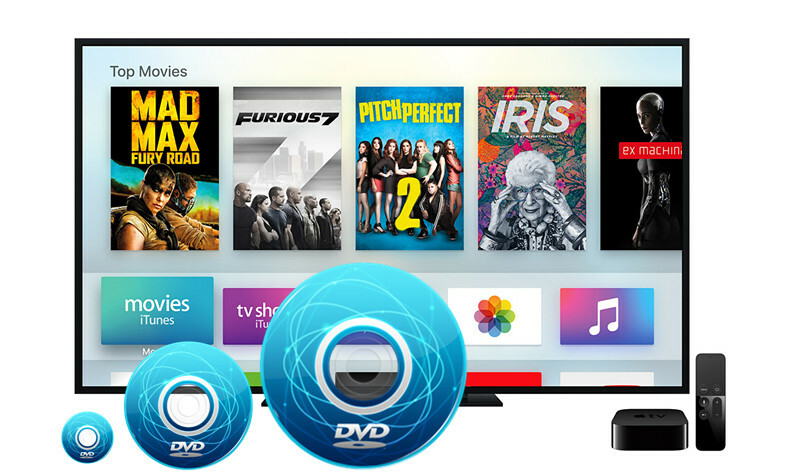 Now it is time to enjoy your favorite DVD movies with Apple TV 4.